What does the homeland of the most delicious chocolate and the country of the world-recognized beer have in common? Each country is unique in its own way and each is famous for something in the whole world. What associations do you have when mentioning the Czech Republic? And Switzerland? And if you take these two countries together? The International Union of Youth (MSM) is ready to expand your horizons and that’s why, especially for you, we have prepared the top most interesting facts that the Czech Republic and Switzerland have in store! Czech Republic and Switzerland are regularly top the various ratings of the world’s leading countries: based on security, average income and happiness. Speaking about security, it is worth noting that military service in the Czech army is voluntarily, but from the service in the army of Switzerland you will have to “pay off” – for this purpose you need to give 3% of all income that you have earned up to 30 years. 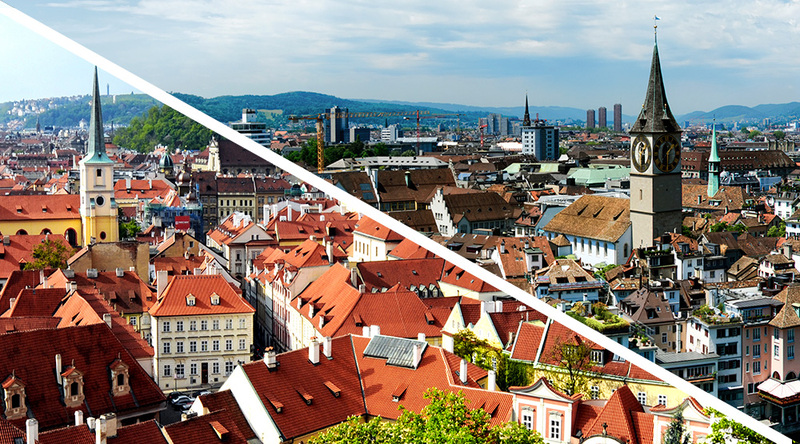 The population of these two countries is very small – in the Czech Republic there are just over 10 million inhabitants, in Switzerland a little less – 8 million. But an interesting fact is that in both cases the number of foreign residents exceeds 20%! The Czech Republic and Switzerland are very tolerant and friendly to all migrants. The most exported commodities in Switzerland are actually chocolate. But the Czech Republic exports most of the products of the automotive industry, mobile phones and other electronics. Only one city in Switzerland (Lausanne) is equipped with a subway. The wagons in it move exclusively above the ground and without the help of the driver. In the Czech Republic, the subway can only be found in its capital, Prague. However, here the wagons are still managed by people and move underground. Speaking of the capitals – an interesting fact that in the Swiss constitution the capital is not indicated at all! And Bern is the capital only by the general recognition of people, but not in any way legally. Sports in Switzerland is incredibly popular! Many of its residents are semi-professionals in some sports field or, at least, a member of sports associations. Things are the same in the Czech Republic – it is almost impossible to find a man who in one way or another is not fond of sports here! There are 875 kilometers between the Czech Republic and Switzerland – 8 hours of driving. However, Czechs may enjoy the beauty of the mountains without leaving their country – a popular national park and reserve, which situated on the border with Germany is symbolically called – Czech Switzerland! The beauty of this place captures the spirit. Another distinguishing feature of these two countries is the high level and prestige of their education! Especially in the hospitality industry! The International Youth Union (MSM) has prepared for you a unique Double Degree Program that will help you to get 2 European diplomas in just 3 years! Save time, money, and discover your own entertaining facts about two beautiful countries in the heart of Europe!